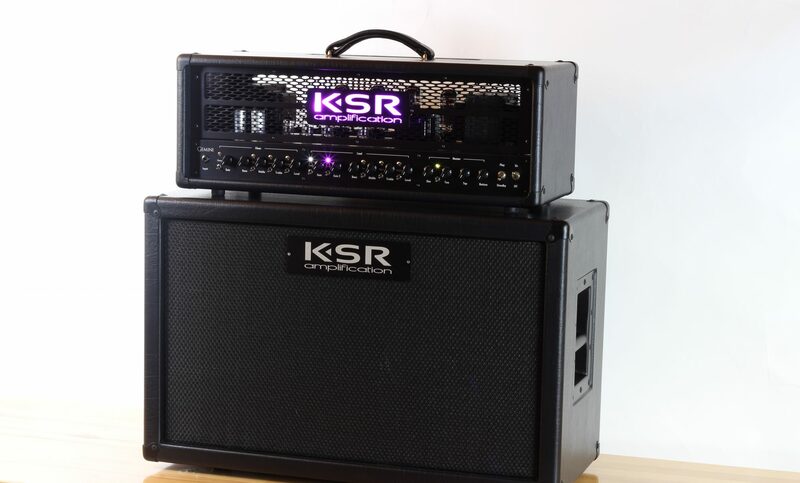 3.5 channel, 100W, rack-mount, multi-mode guitar amplifier. Chris wrote and performed this awesome sounding clip of the Artemis along with his RCS/412 cab loaded with Celestion G12-65 speakers. The Artemis™ line of amplifiers are our latest and most advanced offering. They feature an unprecedented amount of programmable modes and features on each of their 3 channels. If the idea of having up to 144 different MIDI recallable tube tones at the touch of a button excites you, then this is your amp. Built-in to this compact 3U x 15.5″ rack mount package is a 100W power section capable of being loaded with 6L6GC, EL34, KT88, etc. tubes. A transparent, yet fully MIDI bypassable, effects loop couples the versatile preamp to the power section. After the hit of our flagship product, the Colossus H-100™, we knew we needed to take it to the next level with an over-the-top rack mount amplifier. The Artemis™ amplifier consists of 3.5 channels, each with its own gain, 3-band EQ, multiple individually switchable modes, and level controls. This channel produces a wonderfully warm tone that aims to be the best of any channel switching amplifier. Where most other high gains amps seem to include a clean channel out of necessity rather than desire, the Artemis™ has a no-compromises clean channel with its own dedicated preamp tube voiced specifically for huge headroom and sparkling cleans. With the included Gain control on the clean channel, one can also dial in a very cool fat distortion. We also include three tone shaping switches for adjusting the response, voicing, and brightness of this channel for a total of 8 distinct clean tones. This channel is shared with Lead 2. It’s a great sounding mid-gain distortion. One can easily play rock, blues, and country, and then take it over the top by engaging the gain boost Mode switch. Like all the channels in the Artemis™, the gain control for the crunch channel is usable over its entire range. It can even be dialed back to produce a clean sound at the edge of breakup, or cranked for a great rock tone. This channel is inherently touch sensitive and notes easily ring through the crunchy overdrive. It doesn’t compress the tone as much as the Lead channels giving a more natural sound. One can utilize the switchable modes to shape the tone in up to 16 combinations. Even with all the tone shaping possibilities built-in to the amp, the Crunch channel also takes pedals wonderfully, infinitely expanding your tonal palette. Our Lead channels aim to give you one of the most unique, round, warm, yet extremely usable and cutting high gain tones available. The Lead 1 and Lead 2 channels have identical gain structure, and they differ only in their voicing. This voicing is actually switchable via the Voice switch on each lead channel. Lead 1 has two voices — a more upper-mid focused voice taken from the Andy Wood mod, and our standard Lead 1 voicing from the Colossus. These are great from rhythms and leads alike. Lead 2 also has two voices — one is the same as Lead 1 Voice on, and the other is Lead 2 from the Colossus. Some players wonder why they would need two Lead channels. The beauty is one can easily dial in a nice medium to high-gain rhythm tone on one channel, and still have somewhere to go for solo cut in a band situation. Even if you choose to only have one Lead channel, you will have a whopping 96 recallable tone shaping possibilities on your single Lead channel. If you choose two channels, you will still have 64 options on each channel. These options are available on each independent Lead channel as a set of individual switches and indicators for all the switchable functions. Every one of these tone shaping options are recallable via the front panel, foot switch and/or floor controller via RCI, and MIDI CC or PC commands. It is easy to see the tweak-ability of the Lead channels allow one to dial in a large range of tones, from rock to death metal rhythms, and creamy blues solos to shred. The Artemis™ features the same proven transparent and wonderfully performing effects loop from the Colossus H-100™. The loop circuit is true-bypassable via any of the normal means, and has independent Send and Return Level controls for maximum flexibility. The master section also includes power amp response controls, Top and Bottom. The Top control affects the response of the power section to treble frequencies, whereas the Bottom control affects the bass frequencies. These controls are great for dialing in the amp’s response to different speaker cabinets. They also allow the player to optimize the amp for different master levels. The power section consists of a quad of 6L6GC (stock) or EL34 tubes. A custom wound USA made output transformer is a top performer and one of the highlights of this amplifier. Parallel speaker outputs allow one to easily drive two cabinets with a total impedance of 4/8/16 ohms. A slaved line-out allows one to tap the output of the power section in order to feed effects or additional power amps. This output is optionally isolated and balanced. The lit logo is standard on the Artemis, but a solid non-lit logo is available. The lit logo is capable of displaying any color for a number of different amp settings. This is all programmable via a menu system built-in to the front panel by placing the amp into a special mode. A custom foot switch is available for the Artemis as an option. The amp is fully MIDI compatible, so the foot switch is not necessary if the player already has a MIDI based rig. Since we also offer advanced floor controller units that control our products natively via the RCI interface, one has a number of options at their disposal for complete control of their new amplifier. An exceptional tool for tone, bar none. Been playing since the early 90’s, and in that span, went through some bargain priced (see poor tone) amps, but also owned amps such as Mesa Dual Recto, Engl Steve Morse, Mesa Mini Recto, Marshall SL-X, Marshall JCM800 Zakk Wylde model, Peavey 5150 and 6505+, and many more, as well as going the rack processor route a couple of times. I played Kyles original prototype a couple of times and thought it sounded amazing. A couple of local players I knew had him build them one off rack mount amps and each sounded equally stunning. After going back and forth for a couple years due to my budget and the struggle of being able to get a couple of nice used amps for the price, but I bit the bullet and ordered an Artemis 1-100 in 2013. Kyle delivered a couple of months later, also putting in later hours to get it done in time for a show I might add. Absolutely NO regrets. One of the best purchases I’ve made in the years of Gear Acquisition Syndrome. This amp has a great clean channel, but the crunch and lead are where it really shines. It can do just about anything you like. My personal favorite is the “white” setting on the lead channel, with a Maxon OD in front to goose it and make the edge just a touch more surgical, not that it would suffer without it. Built like Fort Knox, with excellent customer service, it’s been a reliable workhorse and has been my go to amp for 5 years now and has served me well playing everything from SRV to Pantera. The effects loop is very nice, though I don’t do a lot of effects, and the controller floorboard is a nice feature, as is the dual masters. This particular amp was sent up north and even passed the seal of approval from Devin Townsend and wound up being used on the Transcendence album before being returned to me. If you long for a world class tube amp, an amp that will only be limited by your ability to wring the notes from the neck, and will give you aural nirvana, do it. You live once, don’t settle. I’m so happy that I didn’t. Thank you Kyle, for building me the amp I always hoped for, and being a great dude to boot! In 40 years I’ve owned many high end and boutique amps. I haven’t been more happy with an amp since my 80’ Mark ii C+. The Artemis has crushing tone with unlimited options. I don’t care how much gain you throw at this amp, it is never harsh. This is something only Mesa can dream about. I dumped a jp c+ reissue of the original Mark ii and it was the smartest move I’ve ever made. I use channel 2 for soloing imo the worlds best solo tone. You don’t even need a pedal in front or behind it. Very warm, singing and down right inspiring. Upper register notes sustain forever. Just enough bite but very forgiving. I have tried many pedals in the loop and in front and I have to say the Artemis takes them all very well and retains all of its characteristics. If you’re looking for a do it all workhorse that will serve you for years to come and keep you inspired to play, then look no further. Thanks, Jeff.